(REAL SIMPLE) -- Real Simple readers reveal the most precious of presents from their mothers..
My mother's greatest gift came after she was gone. She used a certain perfume that was her signature fragrance, and she hoarded bottles of it, since it was difficult to find. When she was down to her last two, she refused to use it anymore. I begged her to just enjoy it, but she didn't listen. My mother gave me red. Yes, the color! She taught me that red and pink are truly compatible (back in the 1940s, this wasn't necessarily a popular combination), that red is a "neutral" shoe color, and that every room needed a touch of this fiery shade. Real Simple: How fit are you? 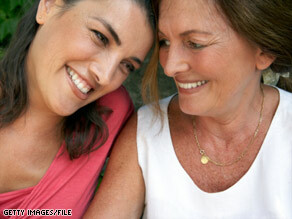 The greatest gift my mother ever gave me was the lesson that a woman is responsible for taking care of her own body. From my early teens, she would tell me how important it was to find a good gynecologist who I could trust and to make my health a top priority. Before my first visit as a teen, she told me what to expect and why it was important. When my mother was a girl, the local library wouldn't allow her to check out books because she was African-American. So she borrowed them from school whenever she had the chance. As an adult, she made it her goal to always read for pleasure and knowledge. I don't know whether the indignity of not being allowed access to books was what created her overwhelming desire to possess and read as many as possible, but I'm sure that played a part. When I first got engaged, I asked my mother if she had anything from her wedding that I could use for my big day. Unfortunately she had nothing to share and was deeply bothered by this. She thought she could maybe make a hankie with her dress, but when my father took it out of storage, it was too discolored. I was born and raised on a tropical island, where rain showers last briefly and the sun always follows. So when I decided to go to college in Philadelphia, I knew I was in for a change. The first time it rained, it poured for three days straight. I called my mom, and she could tell the weather was taking a toll on me. I was the latchkey kid of a hardworking single mother. It was her expectation that my siblings and I would run the house in her absence. We learned invaluable skills while doing so, even though we didn't realize it at the time. The result? Self-reliance. My grandmother's engagement ring. It was designed by my grandfather for their wedding in 1905, and my grandmother passed it on to my mother when she and my father got engaged in 1930. That ring means the world to me because it connects her life to mine. When my mother was dying at home, after years of suffering from Alzheimer's disease, she began clicking her ring finger against the bed railing. My sister and I heard that sound and rushed to her room to spend the last hour of her life with her. We believe that, in spite of her condition, she knew something was happening and was making sure we didn't miss it. --Marca Piehuta, Washington, D.C.